Any time is the best time to replace your flooring when you have teamed up with American Flooring Removal. Our licensed experts are available now to help you take your business to the next level in serving your clients and building your business exposure in the best possible way. We only have the latest product, techniques, and technology. If your tile, hardwood, laminate, concrete, or natural stone floors need to be replaced, we know you need an affordable solution that leaves your business still on budget. Until now, traditional flooring removal processes and equipment was the only option to be had, making American Flooring Removal your best choice! Have you noticed your floors looking worn and needing a face lift in your Keller home? At American Flooring Removal, we know that floors are often the best way to start building equity and value in your home. Changing flooring types or designs can change the look of your entire home, increasing your family’s comfort and your visitors’ enjoyment when enjoying your home. But what do you do when the only option seems to be a messy, time-consuming, budget busting solution? Who can you call to find a clean, fast, affordable option? Our licensed experts at American Flooring Removal have your best interest in mind! Countless homeowners and business owners in Keller and the greater Dallas–Fort Worth area have been patiently waiting for a very long time to have the option in securing an affordable, fast, and environmentally solution to all their flooring removal needs. American Flooring Removal in Keller is here, with the solution to your dust-free, fast affordable, and efficient flooring removal needs. Whether it is tile, hardwood, Saltillo tile, ceramic, or any other types and styles of flooring, there is no better company to call than American Flooring Removal. Our dust-free, environmentally friendly equipment and clean, efficient process make us the top choice in the Keller and greater Dallas-Fort Worth metro area. Our licensed experts know, that when you are looking to remove and replace your floors, you want an affordable, fast, clean solution. You want the best solution for your needs without compromising on your budget, style, quality, and the craftsmanship you absolutely deserve. You want a solution that gets you back to business as usual as quickly and efficiently as possible. You want a process and equipment that won’t leave dust and debris behind. At American Flooring Removal, we are making your priorities our top priority. When you need affordable, environmentally friendly, efficient flooring removal in your home or business, make your first call American Flooring Removal in Keller! Our highly trained experts can quickly and affordably remove your existing flooring and leave your home dust-free. We take the guess work and all chaos out of this process, all while keeping you in budget. Our services are affordable and provide superior workmanship and quality, with dust-free flooring removal for the greater Dallas and Fort Worth areas. No matter your flooring removal needs, American Flooring Removal is the top choice for the Keller area. With the security of having American Flooring Removal on your side, we understand the pain of having a dusty house or business when all you wanted was a new floor! This is precisely why we focus, from the beginning, to ensure our process is dust-free and environmentally friendly. Our state-of-the-art equipment removes the need to have all the plastic drapery and coverings that traditional flooring removal processes require to minimize dust and debris. Remodeling projects can create pounds of harmful dust particles, and we want to make sure your family, employees, and customers can live and work in a safe, dust-free environment after your floors are removed and replaced. With our industrial-grade, dust-free equipment, we have the power to remove the floors from a house or business building in less time than traditional flooring removal equipment can manage. Our efficient process leaves a superior, flat, clean subfloor ready for your new flooring installation. With the time saved on planning, sanding, and other preparation work, you can enjoy your new floors that much sooner! With our up-to-date processes, highly skilled professionals, and state-of-the-art machines, American Flooring Removal in Keller promises incredible results. While American Flooring Removal may not be the only flooring removal company in the greater Dallas Fort Worth area, we are absolutely confident that we are the only one for you! Whether you need a residential or commercial solution to flooring removal and replacement,we pride ourselves on the guarantee that American Flooring Removal provides a fast, affordable, dust-free removal solution. Let us show you how American Flooring Removal can save you hassle, money, and time in your next renovation or home improvement project. Our guarantee is that we can tackle any residential or commercial project in the Keller and the greater Dallas-Fort Worth area. No matter the type of flooring, American Flooring Removal in Keller can get the job done. Call us or Contact us to schedule a consultation or quote today! We serve entire Keller, TX 76248, 76262. 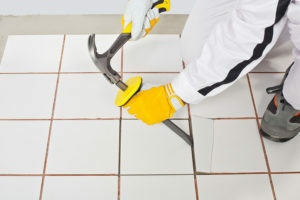 Dustless Tile Removal - Yes it is dustless! Ken and Josh worked me in on a Saturday in short notice and knocked out my master bath quickly. The best part is that the floor is prepped to lay tile. I have had several contractors bid on the job and they all mentioned that the floor is in perfect shape for laying tile and no additional work is required. Well worth the money spent. I will definitely call on Ken and his team in the future. Ken and Josh were very polite, efficient and clean. Crew very organized. Cleaned up well before they left.